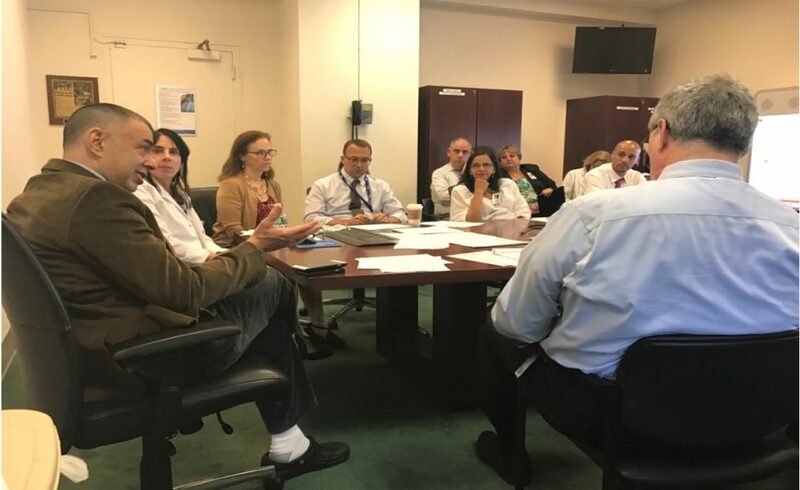 On Thursday, June 21st, new H+H CEO Dr. Mitchell Katz (pictured immediate left) and Doctors Council President Dr. Frank Proscia (immediate right) participated in the monthly Jacobi Facility-Based Collaboration Council (FBCC) meeting. At these meetings are one Doctors Council member from each department along with CEO Chris Mastromano and other administration. The FBCC enables doctors to receive information on what is going on across the H+H system and locally at Jacobi. The doctors provide input to administration and share this with their colleagues. Critical issues in the departments are also discussed. Improvement projects on patient satisfaction and quality initiatives through increased doctor engagement are reported on each month. This creates better patient experience and care along with increased doctor participation. The FBCC is a key part of continual improvement for patients and doctors. If you would like more information on the Jacobi FBCC, to learn who is your departmental representative, or if you have an idea for a project please contact Doctors Council at info@doctorscouncil.org or at 212-532-7690.